Fellow NaNoers (and your support networks), the first week is over. Your count, if you have been exactly on pace, should be approximately 11,666, and if you have made it this far you deserve to treat yourself. Seriously, have a cookie or something; you are a quarter of the way to your goal after a quarter of the time allowed, and that’s a BIG DEAL. Remember, NaNo is about quantity, not quality, and you can do all your editing and cleanup later. I may have mentioned I intended to do things differently this year; in the past I’ve holed up in my house, attempting to eschew the internet as the devil of distraction. I’ve sat in a quiet room with my closest friends and we have all dutifully ignored each other, the only sounds those of our typing in an unspoken urge for productivity (I never realized this until someone pointed out that she listens to the sound of typing while she writes, because she feels like she’s in competition with someone else, then I remembered term paper season in college library and it all made sense). This year, though, I am being interactive. I’ve been participating in the forums, both the regional Philadelphia one and any of the relevant genre ones. I’ve made new friends, both local and topical, forming a small circle of acquaintances who are also delving deep into the American Civil War from various perspectives. I have gone to my first write-in, joining six strangers in my local Panera Bread and having an absolutely lovely time. I’ve been spending evenings logged into the Philly chatroom, arranging my computer screen just so to show the chat window and my story side by side. I don’t often have trouble making word count, usually lingering right around the required number or with a day as cushion. This year I expected that number to dip a bit lower, since I was indulging in all these distractions, but as of this morning, my word count sits at 19,545. That puts me about 7,000 words above the par for Day 7, and I feel like I owe it to the MLs (Municipal Liaisons) for all the chatroom word sprints, and the other Philly WriMos for the support. However, just so you don’t think I’m the world’s biggest baller, I’m just getting to my plot now, so I expect to throw a lot of my first 20k away (but it has been very helpful for character development!). Plus I got super distracted with the election last night, having my worst day this year in which I only wrote around 500 words. Favorite writing music: Nick Cave, Tom Waits, Murder By Death, the instrumental score from Hell on Wheels (please judge me accordingly for that last). Spotify has been my best friend. 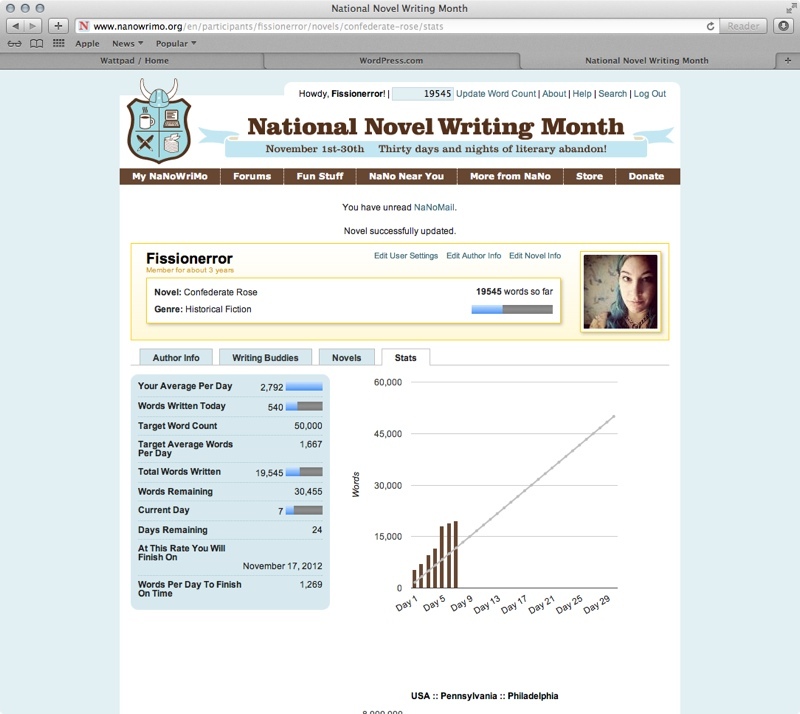 Favorite writing tools: I mentioned Write or Die in a previous post, but I don’t think I mentioned Scrivener; they offered a discounted price for winners of NaNoWriMo last year and I bought a copy, and I’ve just got to say it’s pretty much the best thing ever. It offers a neat corkboard, places to keep all your research material and inspiration, and a very convenient way to organize the segments of your writing. I love it for organizing my thoughts and resources, and it is very helpful if you aren’t certain the order in which some of your scenes should happen as well. It has great templates for different styles of document, and for character sheets and such as well. There are lots of videos, tutorials and walkthroughs on line if you want to do some further reading. 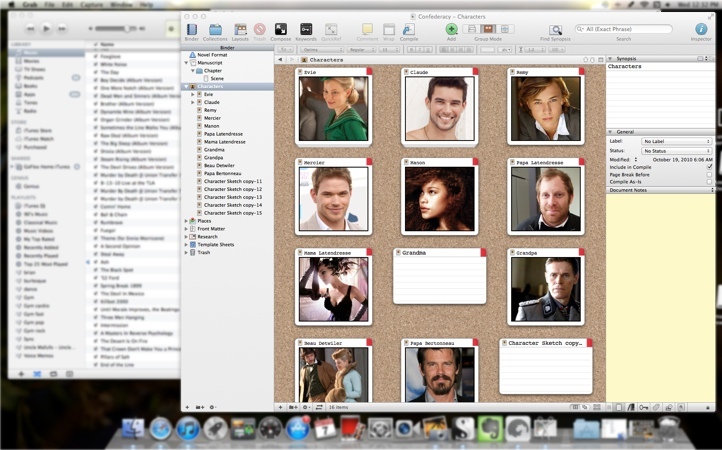 Scrivener cork board, starring inspirational photos of approximately what my main characters should look like! How are you all doing? What has been helping you, and what has been hindering? I’ve also just discovered WattPad; does anyone use it, and have opinions? I’ll admit I haven’t had the balls to try the “Kamikaze” mode on Write or Die (I’d sooner they make the “Electric Shock Mode” joke a reality than potentially lose words I’ve written!) but there’s something about the screen background turning redder and redder that makes me PAY ATTENTION.